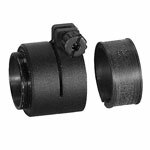 Below is a selection of mounting kits for ATN thermal scopes, ATN night vision scopes, and ATN rifle scopes. Quick release mounts are available, as well as adapters for popular brands of rifle scopes. What mounting system do I need for my scope? We offer a full selection of ATN helmet mounts for most models of ATN night vision and ATN thermal vision scopes. MICH and PAGST helmet mounts for ATN night vision goggles and night vision monoculars are US State Department controlled and cannot be exported outside of the United States. International customers who wish to purchase a helmet mount for an ATN night vision monocular or night vision goggle should purchase the ATN Universal Helmet Mount for their corresponding model.